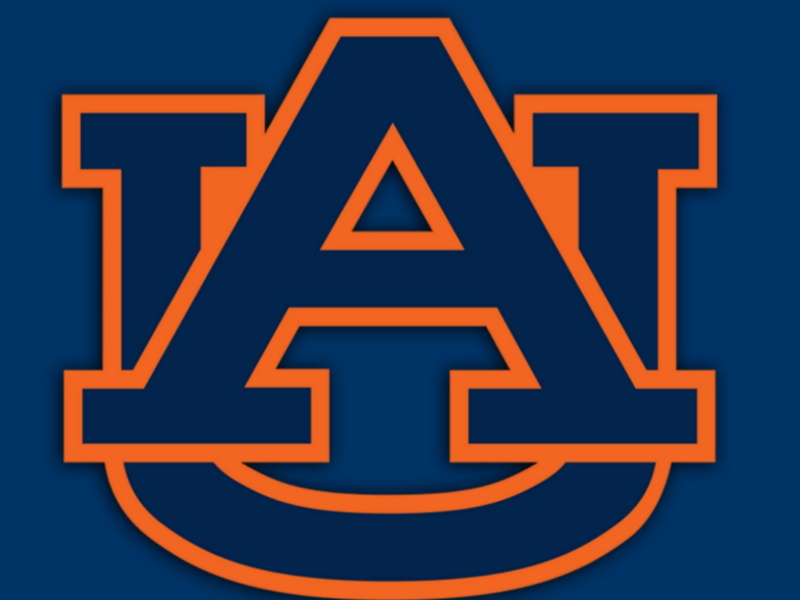 TUSCALOOSA, AL (WSFA) - The Auburn Tigers entered Saturday looking to play spoiler in this year’s Iron Bowl against No. 1 Alabama. It wouldn’t be so Saturday as Auburn would fall in Tuscaloosa 52-21. Auburn opened the game with a three-and-out with quarterback Jarrett Stidham being nearly picked off on third down. The Tigers punt pinned the Tide deep for their opening drive. The Alabama offense picked up a first down, and then another, but that was it. Tua Tagovailoa’s pass sailed too far ahead of its intended receiver and the Auburn defense was off the field. JaTarvious Whtilow was swallowed up on first down. before Kam Martin’s 8-yard gain put the Tigers in a third-and-short situation. Auburn went fast to Martin again and picked up the first down. Shaun Shivers looked to have bust it open with a 75-yard run to put Auburn ahead 7-0 but the play was called back with a holding call. The holding call backed Auburn into a 1st and 27. Stidham opened 0-for-4 before his first completion to Ryan Davis set them up for 3rd and 26. Auburn played it conservatively, running the ball to punt it away on fourth down. A penalty on the punt for kick-catch interference put the Alabama offense in business in Auburn territory. Tagovailoa took a shot at the end zone on the first play but that pass fell incomplete. He hit Ruggs on a simple out route on the next play and Ruggs turned it into a semi-big gainer. Set up outside the 10-yard line the ball found Ruggs again and he managed a 4-yard gain. Josh Jacobs pushed the ball inside the 10 but the Auburn defense held him and forced 3rd and 3. Tagovailoa kept the ball on a QB power around the left edge and powered into the end zone and Auburn was behind 7-0 with 6:38 to play in the opening quarter. Auburn looked poised to respond. A series of runs put Auburn near midfield and then a screen pass to Davis moved the chains again. Stidham was sacked on first down, had his pass batted on second down. His third down pass hit Whitlow on the checkdown and Whitlow picked up the first and then some to keep the drive alive. Plays later, Anthony Schwartz took the handoff out of the wildcat formation and scored from 9 yards out to tie the game at 7 with 2:37 left in the first quarter. Anders Carlson kicked the ball out of bounds on the ensuing kickoff, gifting Alabama with excellent field position at the 35. When it looked like the Tigers were about to stop the Tide and force a punt, Tagovailoa scrambled around and ran for the first down to the Auburn 39. A facemask call on Auburn towards the end of the first quarter put the Alabama offense on the 16-yard line and gave them an automatic first down. Two plays into the second quarter, Henry Ruggs III caught a screen pass on the 4-yard line and Auburn trailed 14-7 with 14:15 to play in the first half. It took only 6 plays for the Alabama offense to score. Looking to answer, the Auburn offense hit the field. The first play went backwards, losing 2 yards. Stidham threw the ball away on second down after he was pressured out of the pocket. On third down, Stidham was again pressured out of the pocket before having his pass broken up by an Alabama defender. The Tigers were three-and-out. 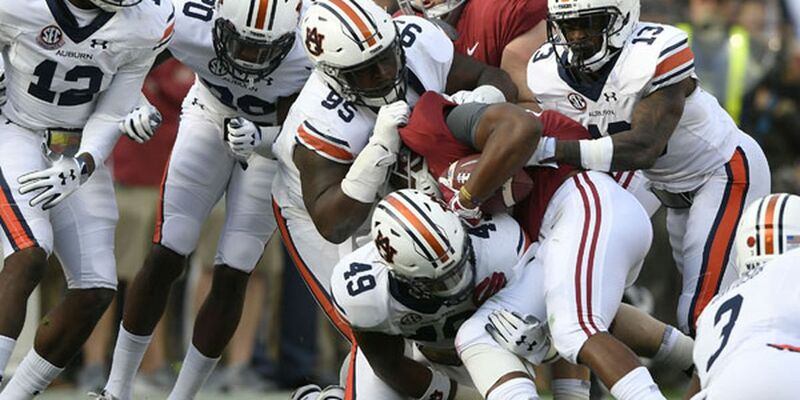 The Auburn defense, not wanting to fall behind two scores looked to stop the Crimson Tide offense, but a big defensive pass interference call pushed the Tide to the Auburn 26. Still, the Auburn defense had an opportunity to hold the Alabama offense to a field goal attempt. When the safety blitz didn’t get home, Tagovailoa found Ruggs for just enough yardage to move the chains. Two incomplete passes put Alabama into another third-down sequence. On that third down, Marlon Davidson nearly had Tagovailoa wrapped up but he spun out of the tackle but the pass fell incomplete to force a field goal. Auburn’s defense did hold but Alabama still added a field goal to increase the lead to 17-7 with 8:59 to play before the half. Auburn was set to go three-and-out but a facemask on Alabama’s Quinnen Williams kept the drive alive for Auburn. In the next series of plays, Auburn would be forced to punt after Stidham’s third-down pass was incomplete. Stidham’s afternoon was shaping up to be one of his roughest. After that incompletion, he was 4-for-14 for just 36 yards passing. His counterpart, Tagovailoa, was 13 of 18 for 108 yards with one touchdown passing and one touchdown rushing. Auburn forced a three-and-out on Alabama’s possession though to get the Alabama defense off the field approaching 5 minutes to play in the half. Auburn followed that with a blocked punt to set the offense up nicely, turning the tide before the half. The drive would begin at the Alabama 23, and Auburn would avoid a disaster of a play when Schwartz fumbled the ball in the air. 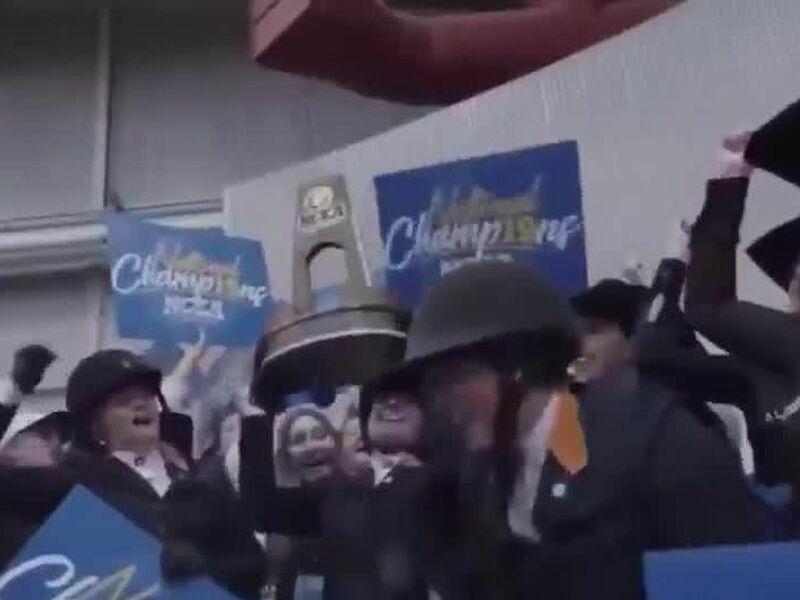 Luckily, it was recovered by an Auburn offensive lineman. Next play, Auburn busted out the trick play. A double-pass from Stidham to Davis - who was a quarterback in high school - who threw the pass to Malik Miller who dove over a Crimson Tide defender to cut the Alabama lead to 17-14 with 4:04 to before the break. It was Smoke Monday’s block of the punt that set up the touchdown score. The Tigers now had confidence. Down just three in Tuscaloosa, the defense could get the ball back with a chance to take lead. On 3rd and 9, the pressure flushed Tagovailoa out of the pocket and his scramble came up short bring up 4th and 1. This time the punt wasn’t blocked and Auburn’s drive would start at its own 20 with 2:49 left. Whitlow picked up the first on two rushing plays to start the drive, but Auburn was then content with going into the half trailing by three. Alabama would receive the second-half kick. After the half, Auburn got Alabama into a 3rd and 1 but Jacobs took the carry on third down for a big gain to near midfield. Two plays later, Jerry Jeudy, on a fly pattern, got behind the Auburn defender and a perfect pass from Tagovailoa dropped into his arms and Jeudy walked in for the 46-yard score. That put Alabama up 24-14 with 12:57 on the third quarter clock after a 75-yard drive lasted just 5 plays. Auburn followed Alabama’s quarter-opening drive with a three-and-out. A fair catch at the Alabama 31 was called and that’s where the Crimson Tide drive started with 11:23 to play in the third. A middle screen moved the chains to open the drive, and with the ball at midfield, Najee Harris was stopped for no gain, but a facemask call gave the Crimson Tide an automatic first down at the Auburn 35. The very next play, Tagovailoa floated his third touchdown pass of the day, this one to Jacobs out of the backfield. Jacobs shed a few Auburn defenders and the Tide began to open his one up, leading 31-14 after just nine total plays in the second half. Stidham took a deep shot down the field on second down but the pass was underthrown and nearly picked off. The third down pass was short of the line to gain but a targeting call against Alabama ejected defensive back Jared Hayden and gave Auburn a first down. Davis - the recipient of the pass - was down on the field for Auburn after taking the hit from Hayden. Davis walked off the field under his own power but walked straight to the locker room. He’d caught four passes for 15 yards to that point. After play resumed, Darius Slayton was able to secure a third down pass for Auburn and gave the Tigers a first down in Alabama territory. Auburn shortly faced another third down - 3rd and 6 - and Stidham’s check down pass to Whitlow went for two yards after Whitlow searched for a running lane. Auburn lined up with their field goal unit on fourth down but audibled into a formation with back up Malik Willis as the quarterback. The Tigers went for it and Willis threw a pass to kicker Anders Carlson who ran into an Alabama defender, unable to pick up the first down. It was a gamble by head coach Gus Malzahn, and it came up short, but the defense would force a three-and-out to get the offense back on the field. With 4:56 to play in the third quarter, the Auburn offense took over at its own 40 - excellent field position. With that field position, Stidham rainbowed a pass on 3rd and 2 to Slayton who came down with the pass and escaped into the end zone for the 52-yard score to put Auburn back into it, trailing 31-21 with 3:31 left in quarter number three. The Auburn defense just needed a stop to be back into it but Tagovailoa hit Devonta Smith on a slant and Smith was able to push to near midfield. Harris took a hand-off past midfield and into Auburn territory before Tagovailoa hit Smith again on a pass across the middle. Smith broke one tackle and walked into the end zone, capping another scoring drive for Alabama in five plays or less. This one lasted only 3 plays and went 75 yards. Auburn was back down by 17, trailing 38-21 with 2:22 to play in the third. Auburn looked to answer but would go three-and-out with Stidham being sacked on 3rd and 18. The Tigers were now in danger of falling behind by four scores punting the ball back to the Crimson Tide. Auburn’s punt wouldn’t make it to midfield, marked out at the Auburn 43, and the Crimson Tide looked ready to strike again heading into the game’s final quarter. And strike they did. On the quarter’s second play, Tagovailoa found Ruggs, who made a leaping grab, for the duo’s second touchdown connection of the day. Ruggs' 22-yard score made it 45-21 with 14:27 remaining. The Tigers looked to shake off Tagovailoa’s fifth passing touchdown of the game and sixth total touchdown with one of their own. The Tigers got to 3rd and 1 in the first sequence of plays before Whitlow powered his way to a first down. Auburn faced another third down in the next sequence of plays and once again converted when Stidham rushed for it himself. Facing third down for the third time of the drive, Stidham was intercepted for the first time of the game. On a play-action pass, Stidham looked to float a pass back across the field but Alabama’s Anfernee Jennings jumped in front of the pass and intercepted it for the Crimson Tide. Alabama took over at the 47-yard line and could really put the game to sleep with another score. And on the first play of the drive, Alabama was back in the end zone. Jalen Hurts entered for the Crimson Tide and threw one pass that Jaylen Waddle took 53 yards to put Alabama ahead 52-21 with 9:29 to play. That would be it for the Auburn Tigers in this year’s Iron Bowl. The Crimson Tide would close it out. The loss knocked Auburn to 7-5 on the season and 3-5 in conference play. Auburn now awaits to see where it will land during bowl season.